Danica’s Ford is on eBay for $16.99 shipped if anyone needs one. Item number 292461090517. This is not my listing, I was looking and this popped up. Thanks for the heads up, needed a 3rd one for my pending Ryan Blaney builds, managed to get the $17 dlvd ones on Amazon a little while back, and only bought 2. According to the listing, the seller has sold 149 so far and the listing is still going. Got 3 delivered today, only needed 1 but why not? I’m sure i can find something to build with the 2 extras. For some reason i am still watching the listing and contemplating buying more. I think they had over 300.
thanks, just added it to my EBAY watch list. 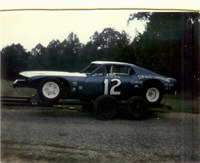 Bought 10 of the Danica and 10 Fireball '57 Fords... Great price. Bought 4 a couple of days ago, thinking about buying a few more before the well runs dry. Was curious as to how many cases they have sold as of right now, on Friday at 2216 hours, they have sold 173, that comes out to 14.4 cases of Danica kits. They have plenty more to sell to you. Just saw on Amazon this kit is being sold by the same eBay seller for the same price. Just letting everyone know. Got my 4 kits yesterday, think I am going to buy four more before they run out, its so hard to pass up $17 shipped kits. I assume this is the same seller you are talking about. Original seller that i bought from for $17ish. Must be a price war on Amazon. VRCHobbies is still selling there's for $16.99. With Stoney releasing new decals, I may have to snag 2 more if they get in the $15 range. you are seriously going to see if they make it to the $15 range? these are an absolute steal at $17 dlvd. $13.45 - Are you kidding me? 2 more coming from Amazon. they got down to the 15 dollar range. Where are the ones for $13.45? Only came across the one seller... unless they were that low for a minute and went back up. That has me wondering also. Early bird special? Seller was MMP Living. The $15.65 ones are drying up, says there is only one left. Bought me 2 more off ebay for $16.99 each, dlvd. Couldn’t control myself. I ended up buying 12 from the Ebay seller, the last four will be here this week. Kinda in Limbo on if I want to buy more with Ford announcement of switching to Mustang in 19. Back around the holidays, my local Walmart had a model kit display that had a few Harvick and Danika kits. I picked up the last Danika kit they had on clearance yesterday for $13. My stash is up to 7 Fusions now, with 4 of them committed to builds. 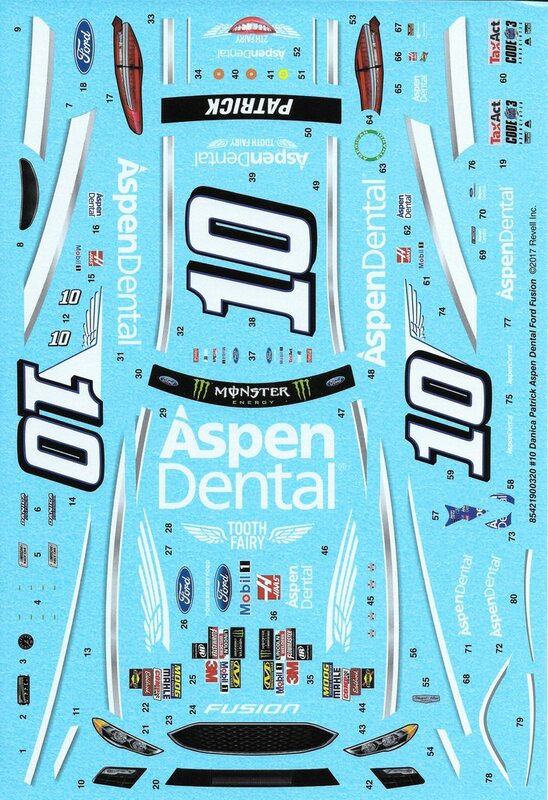 Does anybody have a picture of the uncut kit decal sheet? If no one else comes up with a pic, i will scan one and post it for ya in the next few days. BTW, these are still $16.99 with free shipping on both Amazon and ebay. Glad I saw this, been waiting for the price to drop. Ordered 1 which will be here today. Probably the only 1 I'll buy, not into building modern Nascar anymore but looking forward to seeing this new kit. Yep, had my sister back in PA pick me up 3 more for my stash at $9.99 each. Picked up 4 from Ollies on Saturday for $ 9.99 a piece, they had about 30 more on the shelf. I have no idea why I even bought them besides the fact it's hard to pass up on $10 a kit from any era. I was just in the Middletown NY Ollies yesterday and did not see anymore Danica kits on the shelves. none in Wilkes Barre or Mt. Pocono. I checked at both. I just want one. So they have 3 left. I'm picking up a couple of more tomorrow just to have some more. Hard to beat $10 a kit. Picked up three myself in Richmond Va at Ollie's , going to Gloucester tomorrow, gonna check down there, may pick up,a couple more if there's any left! Pens87, p.m. me, I'll trade you one of my three I have now if you really want one! Checked my Allentown Ollies on Saturday, still had about 20 left on the shelf. Penguin87, if you need more let me know, Pulln4dejr is a great guy, he hooked me up with some kits a while back I know he will help you out as well. Hard to beat $10 a kit for you guys that build these newer era of cars. Thanks for the info Hurricane. Might be down that way today or tomorrow. Hope there will be some left. I found one left on the shelve today in the Scranton, PA store. I never asked anyone at either store if they had any. Just looked around. Now I'm wondering if they might be only putting a couple out at a time. Thanks everyone for your help.